I am dating myself, but I grew up humming John Denver’s song Calypso and huddled around the TV when one of the Jacque Cousteau SCUBA specials came on. Diving amongst coral reefs surrounded by resplendent fish of every color and shape it was a dream. I did get my SCUBA cert in 1970 but it was a long time before I ever had the opportunity to dive in tropical waters. This past winter I spent almost two months in the Caribbean. I was with Sue Plankis who had never dived. We decided to both get certified, so did a lot of research and checked out dive shops in Costa Rica, Cozumel and Roatan to find the best place to be trained. We found it. And it is available for you. It is an incredible maze of cabins, decks, pools, fountains, and artwork, right on the best stretch of beach on Roatan Island. Half-way between West End and West Bay – two tourist centers with restaurants and bars. For less than five bucks you can take a water taxi to either, but we sleep in our secluded and quiet resort off the beaten track The cabins have fully equipped kitchens, nice bathrooms, and beds. A nice guy from Michigan owns the place, and he has an extraordinary staff. Elba Rosa keeps your bathroom sparkling, and Carlos will climb a palm tree and use a machete to prepare a coconut for you. Free use of sit-a-top kayaks and SUP’s. There is a reef nearby for snorkeling and a nature park just a quarter mile walk down the beach. Maybe best of all. The best dive school I have found in the Caribbean is right next door. In fact, they share the dock with our cabin complex. The own Denisse is from Chile and speaks impeccable English. The equipment is top notch, and Denisse takes special care that the air for the tanks is clear and fresh. Her boat is seaworthy and piloted by a seasoned captain. The PADI cert instructor is American and a great teacher. $1,699 for eight nights in the cabin, PADI SCUBA certification which includes four open water dives, and transfers from the airport. Roatan has non-stop flights from major cities including Minneapolis, Chicago, and Toronto. I call this the best bargain in the Caribbean because you could easily spend four times this amount for something similar on Grand Cayman, the Virgin Islands or even Cozumel. Plus, you get Rob and Sue. We can hang out together do some barbecues, beach campfires, swimming and sunbathing. Full disclosure this is the rainy season, and we expect showers and maybe even a stormy day or two. But it will be warm, the diving will be incredible, and with a little work and effort, you will walk away with PADI open-water SCUBA certification that is recognized and honored worldwide. 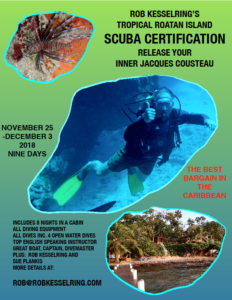 Join us November 25 to December 3, and you can be like Cousteau. This experience is limited to eight participants and only offered once in the winter of 2018-19. E-mail Rob today to reserve your space.